When I was looking through a pile of my collection of vintage photos I came across this handsome chap and decided he was to be the focus of my first nautical make . On the back of the photo was this name : Capt Jermyn of SS. Berengoria ....so this is for you Capt Jermyn x I started with some mountboard and covered wit Tim Holtz paper, inked distressed and generally messed around inkily until I was happy. I then collected together lots of elements that I thought I might use..I find this a great way of collecting together pieces, that I may or may not use in the end...you can then move them around and add to or discard pieces along the way . So onto my focal photo, he just looked so proud, full of life and adventure and I just kind of went form there..I love this photo and hope he would have liked what I did with him x I scuffed , inked and distressed the edges and added onto more paper stack. Lots of idea-ology added in. I added some of the vellum tags from the new packs of ephemera and some more idea-ology. To carry on the nautical theme I added one of my much loved blueprint stamps and layered the middle element, lots more inky distress here . I love chit chat stickers to add those few words onto a piece and of course some tissue tape and film strip is never far away...I even managed to resist adding a cog! I made a little pocket watch using paperstash, glossy accents an type charm and a swivel clip. Finally a little wire and some more tissue tape to tie the design together. keep those fingers inky ! 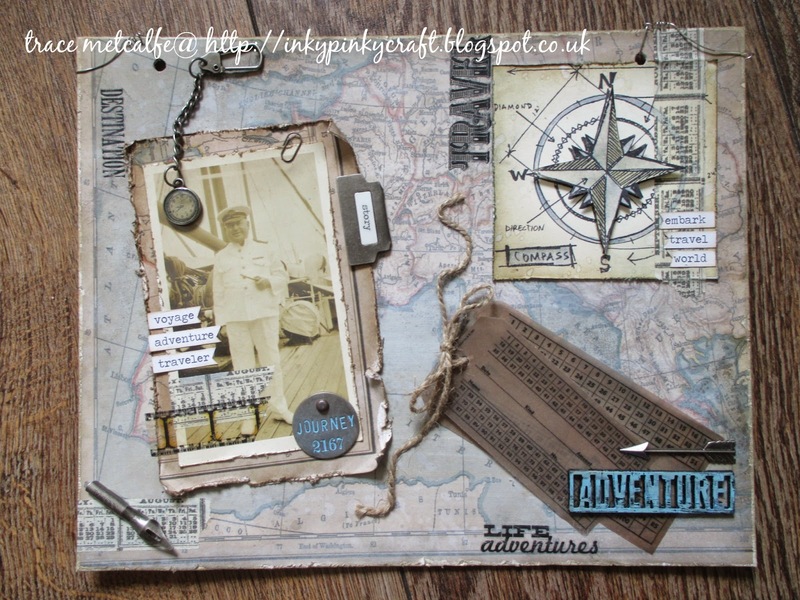 I love this board Trace and the photo of Cpt.Jermyn, all the elements give the feel of a naval man and adventurer who looks proud and happy on his ship. Gorgeous nautical piece Trace, very clever how you wove all the different elements together, it looks great! Well I think you did Capt Jermyn proud! I love all the embellishments on and around that fabulous photo. What a wonderful nautical piece. I love it! This is wonderful. I love all your nautical elements and the backround is perfect too. That photo could not be more perfect!!! Love him! Gorgeous layout of all the goodies! Love the whole thing! The perfect photo for the theme - absolutely love what you've created around him - a fabulous nautical make!